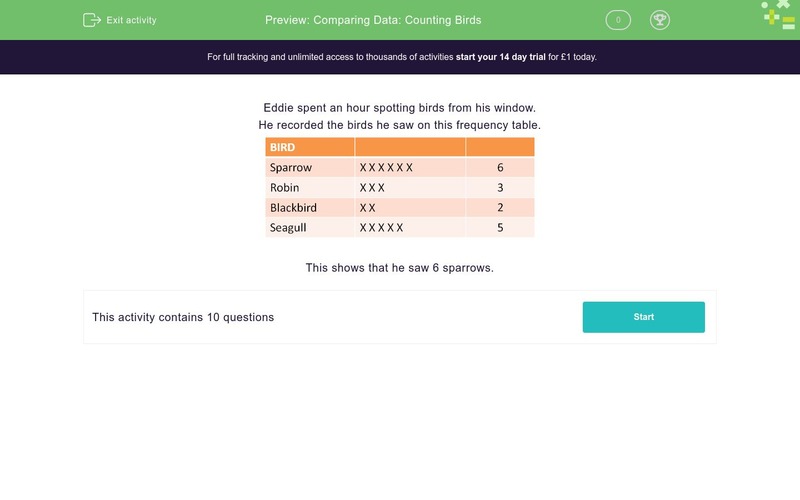 In this worksheet, students count and compare data relating to bird varieties. Eddie spent an hour spotting birds from his window. He recorded the birds he saw on this frequency table. This shows that he saw 6 sparrows. Eddie's Bird frequency table is shown below. How many blackbirds did he see? How many seagulls did he see? Which bird did he see the most? How many birds did he see in total? How many of the birds were not robins? Eddie repeated his survey the next day. His new Bird frequency table is shown below. How many of the birds were robins? How many of the birds were blackbirds or robins? How many of the birds were magpies or sparrows? Which birds were seen 5 or more times? How many Emus did Eddie see?